This article briefly outlines some issues that should be considered when equipping a room/lab. The microscopes should be locked away in a cupboard to that no parts disappear. The cupboard also protects the instruments from dust. Small children may need help lifting the heavy instruments. In most cases the teacher will already be supplied with an appropriate working environment. In the case that the school is required to set up a lab, the following pages may serve as a help. One should not underestimate the costs of setting up a suitable microscopy environment. The following issues should be considered. Availability of power plugs: It should be possible to plug in the microscopes into the AV outlet without the use of extension cords. Needless to say, tripping over power cables can be expensive on equipment and student health. 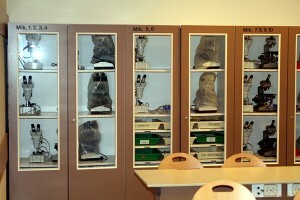 Place for students to put bags: Personal belongings of the students, such as school bags, should be stored away from the work space, but still be accessible. It may be possible to store the bags beneath the work table. The teacher has to be able to move freely between the work areas. I require the students to deposit their bags in the front of the classroom. Stable tables: The talbes should be mounted on the floor. This not only reduces vibrations but also prevents accidents. 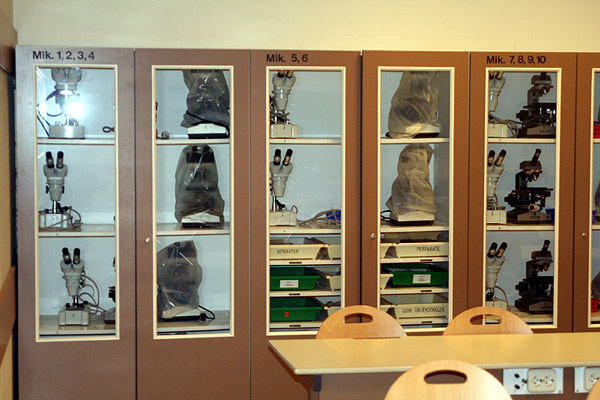 Storage place for microscopes: The instruments should be locked away in a dust-free environment. The instruments should be reachable without problems. There should also be a place to accomodate the accessory equiment. Curtains: Direct sunlight makes observation difficult. If the teacher uses a videoprojector to present something, then curtains are also necessary.